Brazil’s President Dilma Rousseff speaks with journalists after meeting with her lawyers regarding impeachment proceedings against her at Planalto presidential palace, in Brasilia, Brazil, Dec. 7, 2015. Impeachment proceedings against Brazil's President Dilma Rousseff were delayed Monday by a fight between supporters and opponents trying to stack a lower house committee that will report on whether she committed an impeachable offense. Rousseff's main ally, the fractious Brazilian Democratic Movement Party (PMDB), split over her impeachment, resulting in separate lists of lawmakers to sit on the 65-member committee. The division was a rocky start for Rousseff, who is counting on PMDB votes to save her presidency from opposition lawmakers accusing her of breaking budget laws as she ramped up economic stimulus during her re-election campaign last year. Earlier on Monday, Rousseff urged Congress to cancel its recess in January and deal swiftly with a request for her impeachment, aiming to quash it before a growing economic crisis throws more of the country against her. Selection of the special committee was postponed from Monday to Tuesday, despite protests by leaders of Rousseff's Workers' Party that the opposition was using delaying tactics. 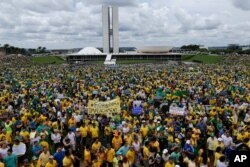 FILE - Thousands of demonstrators take part in a protest against the government of Brazil's President Dilma Rousseff, in front of the Brazilian National Congress, in Brasilia, Brazil, Sunday, March 15, 2015. "This is war and we are going to fight it out," said Sibá Machado, a Workers' Party leader in the house, who said the impeachment proceedings were already "contaminated." The president's aides have said she has enough votes to block impeachment in the lower house, but that could change as her opponents whip up anti-government sentiment. An early vote before Brazilians get back from their January holidays may favor Rousseff, since the pro-impeachment campaign could gain momentum as an economic recession is expected to worsen early next year. "In this situation of political and economic crisis, it is important to call back Congress," she told reporters. "It is not right for the country to be kept waiting until Feb. 2." Rousseff also said she had no reason to distrust Vice President Michel Temer of the PMDB party, who has not publicly taken a position on her impeachment. 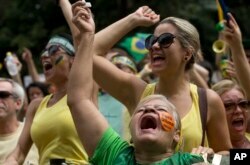 FILE - Demonstrators shout anti-government slogans during a march in March 2015 demanding the impeachment of Brazil's President Dilma Rousseff. If two-thirds of house members vote for impeachment, the president would be suspended pending a 180-day trial in the Senate, while the vice president runs the country. Temer's public silence and the resignation of Civil Aviation Minister Eliseu Padilha, a senior PMDB member, from Rousseff's cabinet Friday led to speculation that Temer is positioning himself to become president if she is impeached. "We have to see what the majority of the party thinks. At the moment, (Temer) is beginning that assessment," Padilha told journalists Monday. Temer wrote a personal letter to the president regarding the government's distrust of him and the PMDB, according to a statement from his office late Monday. The vice president called for national unity and did not propose a break between parties or the government, his office said in the statement. The president's office confirmed Padilha's resignation and said the civil aviation ministry's executive secretary, Guilherme Walter Ramalho, would take over as interim minister.